Green Tea (Camellia sinensis) is the species of plant whose leaves and leaf buds are used to produce Chinese tea. It is of the genus Camellia, a genus of flowering plants in the family Theaceae. white tea, green tea oolong, pu-erh tea and black tea are all harvested from this species, but are processed differently to attain different levels of oxidation. Kukicha (twig tea) is also harvested from Camellia sinensis, but uses twigs and stems rather than leaves. Use in facials & masks, body wraps, bath teas and soaps. 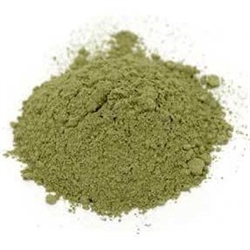 Green Tea Powder can also be used to naturally color soaps and other products various shades of green from medium to dark. Great product..product is exactly how it is presented. I really like to use this in my facial cleanser.